I believe things go wrong so you can appreciate them when they're right. You believe lies so you eventually learn to trust no one but yourself. You're going to meet people who lie to get what they want, but they teach you a valuable lesson. 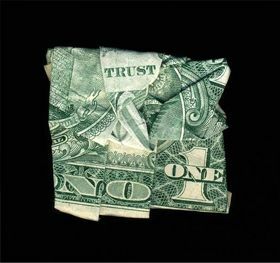 Who not to trust. The Worst harm comes from where you lastly expect it. So forget about your enemies and think what your friends will do. Never trust people from what they say, trust them from what they do. When someone breaks your trust. 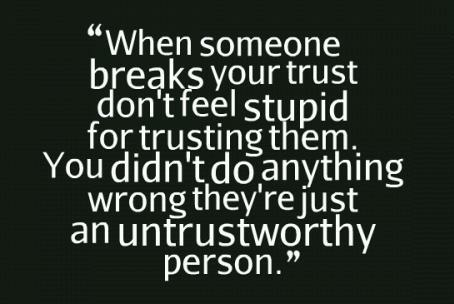 Dont feel stupid for trusting them. You didnt do anything wrong, theyre just an untrustworthy person. The world is built upon trust. Trust helps us to gain confidence and rely upon others. You confide in them the deepest of your secrets. It takes many years to build a long lasting and strong trust. But when this trust is breached, all hells break lose. To quote anonymous, “I have learned that it takes years to build up trust, and it only takes suspicion, not proof, to destroy it. The main pain that kills trust is telling lies and playing double standards. In such a situation, we go to the brink of despair and say trust no one. 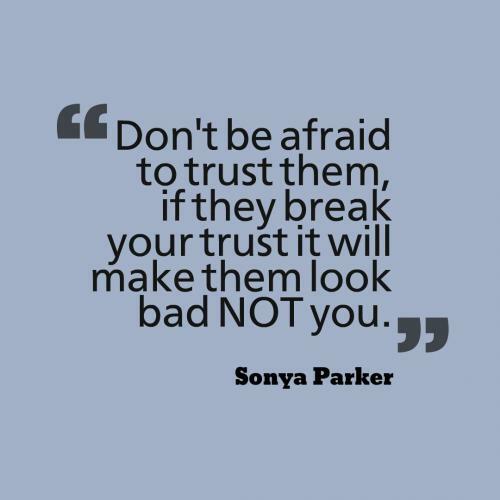 It is very dangerous to trust untrustworthy people as it could lead you into more troubles. Instead of trusting those whom you firmly believe, it is better not to trust any one. This is true for friends, relatives and strangers alike.